The Dutch Song Database (Nederlandse Liederenbank in Dutch) contains more than 175,000 songs in the Dutch and Flemish language, from the Middle Ages through the twentieth century. It contains love songs, satirical songs, Beggar songs, psalms and other religious songs, folksongs, children's songs, St Nicholas and Christmas songs, and so on and so forth. The main sources for all these songs are songbooks, songsheets (broadsides), song manuscripts and fieldwork recordings. For every song the source is indicated where the text and/or the melody can be found. In some cases one can click directly to the complete text, or to the music, or to a recording. The Dutch Song Database was compiled at the Meertens Institute in Amsterdam and is maintained and developed further by its Centre for Documentation and Research of Dutch Songs, in cooperation with several partners. 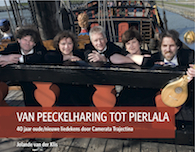 On 24 November 2014 the Dutch Data Prize of the Humanities & Social Sciences was granted to the Dutch Song Database. The biennial Prize (EUR 7,500 to make the dataset (more) accessible) is an initiative of Research Data Netherlands. The jury was unanimous in its praise for the Dutch Song Database. Chairman professor Kees Aarts especially commended the versatile use of this database. "The database is already being used by many scholars in the digital humanities for literary, musical, religious, historical and ethnological research. Journalists, musicians and high school students also use the database a lot. This well-structured database is therefore a great asset for Dutch academic and cultural heritage." What's in the Dutch Song Database?